New Caledonia (in french, la Nouvelle Calédonie) is an archipelago located in the Pacific Ocean 1,500 km east of Australia. It is centered around a main island, Grande Terre. The archipelago also includes several smaller islands: the Belep Islands to the north, the Loyalty Islands to the east and the Chesterfield Islands to the west. The Isle of Pines, to the south, is a popular tourist area. The center of Grande Terre is mountainous. The east coast is wetter with tropical forest. The west coast, protected from the prevailing winds, is drier. There are paradisiacal and uncrowded white sandy beaches bathed by a turquoise sea. New Caledonia offers a rich biodiversity. 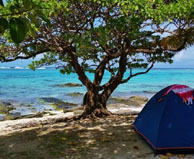 The Coral Sea Nature Park surrounds Grande Terre and the Loyalty Islands. With 1.3 million square kilometers, it is the largest natural park in France. New Caledonia is an exceptional destination that offers landscapes still protected from mass tourism. Nouméa is the main city of New Caledonia. It is located on a peninsula on the southwest coast of Grande Terre. You can find there all the equipment of French seaside resorts in mainland France. The coast offers a succession of bays for swimming or boating. The coast is bordered by easily accessible islands and islets, with preserved mangroves. Anse Vata is popular with windsurfers. 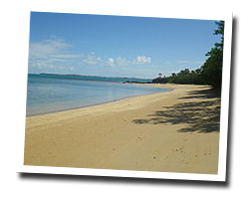 Citrons bay offers a beautiful family beach bathed by a lagoon with transparent waters. Dumbéa is part of the agglomeration of Nouméa, in a green area. There are hiking trails with views of the Pacific and a beautiful coastline called "Dumbéa sur Mer". Mount Dore is located in the south of Nouméa. The road called “the corniche” offers beautiful views of the Coral Sea to reach the beautiful bay of Plum. Further down, the Great South is a preserved area. 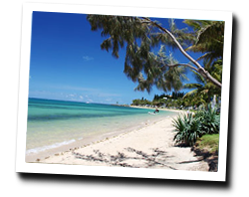 Bourail is located on the west coast of Grande Terre, in the north-west of Nouméa, between sea and mountains. The seaside is known for its beaches: Poé, Roche Percée and the Bay of Turtles. La Roche Percée is one of the only surf spots in New Caledonia. 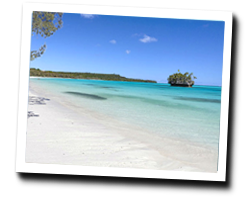 Poé is a white sandy beach bathed by the most beautiful lagoon of the Grande Terre, a UNESCO World Heritage Site. 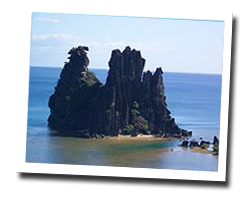 The Trois Baies trail offers beautiful views of the Coral Sea. Poum is located at the northwestern tip of Grande Terre, in a wild and preserved area where wild horses run. Offshore, the Bélep archipelago is made up of five small islands. Hienghène is located on the east coast of Grande Terre. It is one of the most touristic places of the Northern Province, with a marina. The seaside is renowned for its black rocks with special shapes, such as "la Poule Pondeuse" (the broody hen). Les Iles Loyauté (Loyalty Islands) are an archipelago located east of Grande Terre, in the Coral Sea. 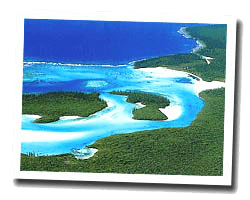 You can find four islands: Maré, Tiga, Lifou and Ouvéa. These paradisiacal and preserved islands offer dream landscapes. 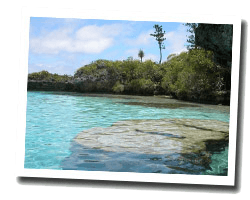 Lifou is the largest of the Loyalty Islands, with a surface equivalent to Martinique. The coast is rugged with deep bays and long white sand beaches. Coral bottoms offer magical colors. The interior of the island is a vast plain covered with tropical forests. Tiga is an islet floating on the Coral Sea. It administratively depends on Lifou. 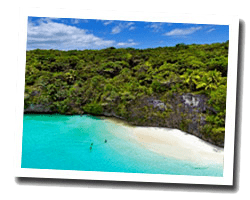 Tide is the wildest and highest of the Loyalty Islands. There are small sandy coves nestled between rocky promontories and long unspoilt beaches lined with coconut palms. Natural pools of freshwater or seawater shelter fish and turtles. Ouvéa is one of the most beautiful atolls in the Pacific, with a white sand beach stretching for 25 km, bathed by transparent waters. The Ouvéa Atoll and the Beautemps-Beaupré Islands constitute one of the six New Caledonian lagoon areas listed as World Heritage Sites. Ouvéa was called by a Japanese novelist "the island closest to Paradise". L'île des Pins is one of the most touristic places in New Caledonia. 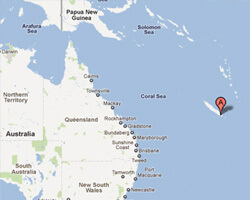 It is accessed by boat and plane from Noumea. The island owes its name to James Cook who named it because of the abundant presence of colonial pines. There are large sandy beaches bathed by an emerald lagoon. The most famous sites are Kuto Bay, Kunamera Bay and Oro Bay.